In September 346 rock-throwing attacks were recorded, in October 375, in November 420, and in December 344. Most of the December attacks occurred in the final week of the month. In the first week of January there were 169 recorded attacks, a pace that, if maintained, would lead to almost 700 attacks by the end of the month. Issacharoff writes that the increase in rock attacks could be linked to exam season in Palestinian high schools, although a similar increase was not recorded in previous years. The rock attacks were also linked to a series of anniversaries taking place around now, including that of Fatah’s founding and first terrorist attack on January 1, 1965, and of the assassination of Yahya Ayyash, Hamas’s chief bomb maker, on January 5, 1996. However, one cannot ignore the possible linkage to the UN Security Council resolution last month and Secretary of State John Kerry’s Mideast speech two weeks ago criticizing Israeli construction in the West Bank and eastern Jerusalem. The uptick in attacks also comes one week before the Palestinians are scheduled to attend a farcical Paris “peace” conference at which the international community, minus Israel, is slated to get together to set the future parameters of a Palestinian state. I raised questions about the possible motivation for the deadly truck-ramming terrorist attack in Jerusalem on Monday. The attack, which killed four and wounded 17, was carried out in the eastern Jerusalem neighborhood of Armon Hanatziv, also known as East Talpiot, just after the UN and Kerry singled out Israeli construction in eastern Jerusalem. The Palestinians have a long and sordid history of responding to peace talks or international pressure on Israel with a terror campaign targeting Israelis. Arch terrorist Yasser Arafat personified that tactic when he responded to generous Israeli statehood offers in September 2000 by launching the deadly Second Intifada instead of accepting a Palestinian state or even making a counter-offer. 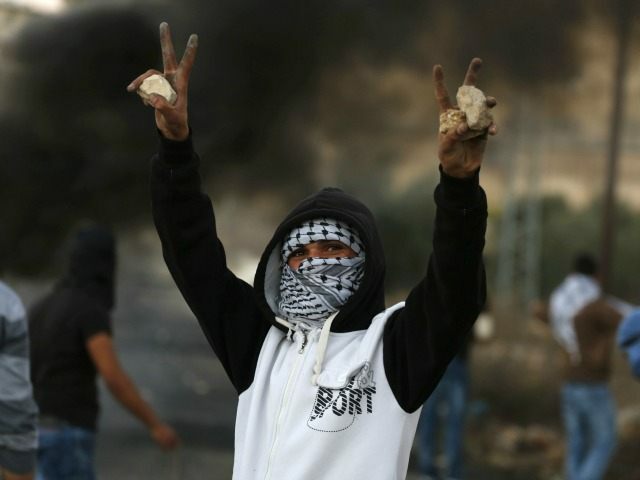 That intifada was kicked off with rock-throwing attacks before it morphed into a full-scale terrorist onslaught of shootings and suicide bombings. Within less than 48 hours of last month’s anti-Israel UN resolution, there was an immediate surge in Palestinian terrorist attacks targeting Jews in the West Bank and eastern Jerusalem. While it is still too early to evaluate, the spike in rock throwing attacks and other Palestinian terrorist incidents may be indicative of an alarming trend that could lead to the one word Israeli defense officials try to avoid using in their predictions: intifada.